INDIAN LEATHER is a Digest of leather News Published on 8th of every month. Established in 1967 by Late Sri S.Sankaran, it has successfully completed 50 years of continuous publications and has entered 51st year. It has a wide readership and covers many important news in Leather, Footwear and Allied Industries. Indian Leather Publishes regularly the pre and post fair news/reports of all the major International Leather Fairs and events. It covers the burning problems of the industry. 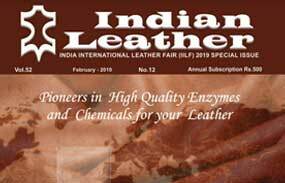 INDIAN LEATHER also publishes News on Technical Seminars, Technical Papers, Company Profile, New Products, Leather Fairs held around the globe, Market News Services for hides, skins and semi-finished leather, technological developments and fashion trends and forecast etc., to name a few. Indian Leather reaches the cream of the Industry and Trade in India and Overseas countries. INDIAN LEATHER apart from serializing technical articles in its regular issue, has also published many technical books on Leather like, Surface Defects of Hides & Skins, A Manual on Practical Leather Processing and Practical Guide for Chemical Analysis & Physical Testing of Leathers and Vegetable Tanning Materials of India, to name a few to its credit. INDIAN LEATHER regularly participates in major National Leather Fairs and important leather- related seminars. INDIAN LEATHER is also Media Partner in many International Leather Fairs organized in China, Indonesia, Bangladesh, Russia, Sri Lanka, etc. and also in major Leather and Footwear events liked IULTCS Congress, World Footwear Congress, etc. organized across the world. READERSHIP: Tanners, Leather Chemical Manufactures/Dealers, Manufacturers of Footwear, Leather Goods, Garments, Manufacturers of Machineries for Leather, Footwear and Leather Goods, Components and Accessories, Educational Institutions and Government Trade Bodies.